Use the freshest squid you can find. I prefer to use medium or small squids as I find them more tender. Larger ones are more succulent and with more bite when just cooked yes, but tend to become tough and rubbery when cooked for too long. 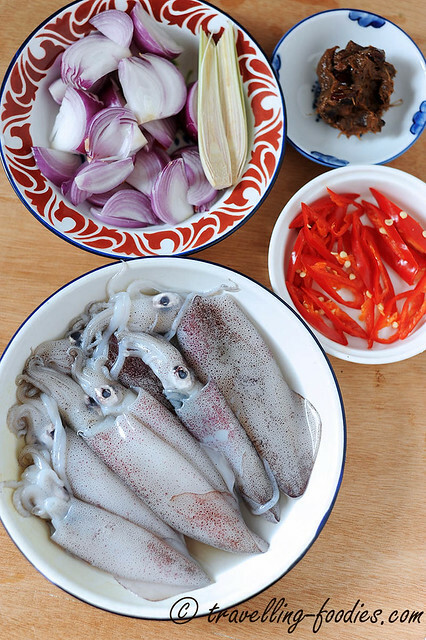 In any case, the actual cooking time for the squid is less than a minute. 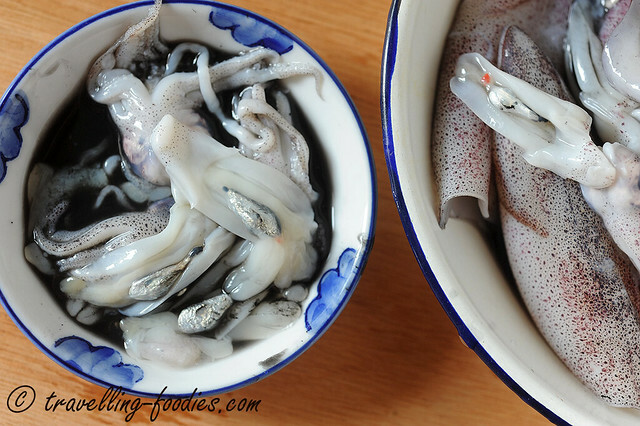 There are two ways for squid to remain tender, the first is very brief cooking over high heat, or the other is prolonged cooking likening simmer-braising until all the meat is rendered soft and tender. There is really no in between. To collect the ink, carefully dislodge the head & tentacles from the body. The ink sacs are the small tear-shaped silvery-looking pouches. Take care not to burst them prematurely. When handled carefully, the ink pouch can be pulled away from the rest of the entrails of the squid without breaking it. Simply puncture the pouches with a toothpick or sharp end of a paring knife inside a dish to collect the ink. Do this carefully to prevent them from bursting. That is gonna be a helluva mess we all don’t wanna see! When cleaning the squid, remember to remove the transparent, plasticky quill from the body. Gorge out the interior of the squid body with a small spoon and remove any debris within. Sometimes, one may find bits of sand, broken bones and even small fish or shrimp within, remnants of the animal’s last meal before it was caught to meet its maker. When one is lucky, one can even find prematurely formed egg sacs within. They are quite yummy but can be an acquired taste for some. The head is harder to “clean”. The squid eyes also have ink stored within them it seems but the quantity is far to little compared to what the ink sacs contain. So its quite futile to salvage any ink from there. To clean the eyes, I place the head in a bowl of water and use a utility knife to puncture the eyes and scrap out the contents. Next, the head is inverted to expose the “beak” of the squid (see photo above) which is basically the feeding orifice of the squid. It is shaped like a pearl. Holding the back end, the beak is squeezed out of the head and discarded. It is too small to be eaten, unlike those from bigger squids or cuttlefish which the Japanese relish and grill “yakitori” style, popular in some izakayas. Run the finger down the entrails behind the head which was pulled out from the body and near where the ink sac once was, one would find some hardened cartilage like structures. Cut them away as they are too hard to be eaten as well. Give everything a quick rinse and the squid body can be sliced into rings. 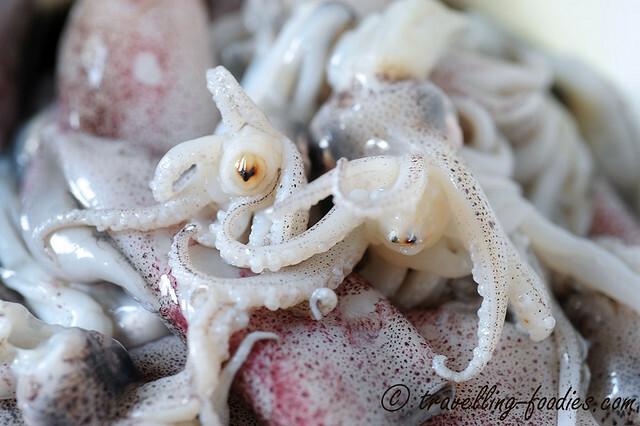 If small squids are used, the whole body can be left intact without cutting. Once the squid is processed, we are ready for the next level of preparation. The rempah for this recipe is really simple as it only contain 3 ingredients, i.e. 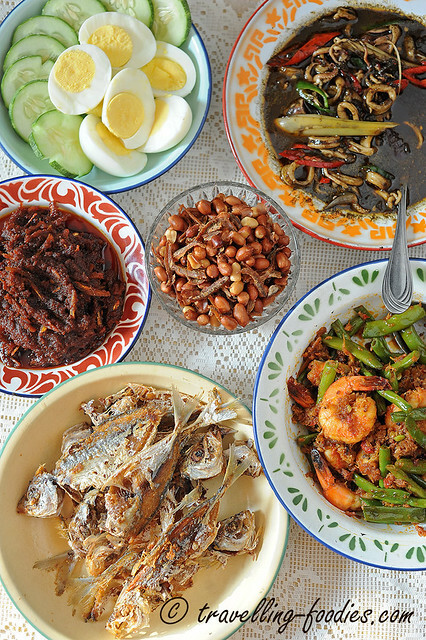 bawang merah, cili hidop and belacan. These ingredients are either pound or blended before being fried together with the bruised seray and chopped bawang beseir. It smells really heavenly with just these ingredients being stir-fried! 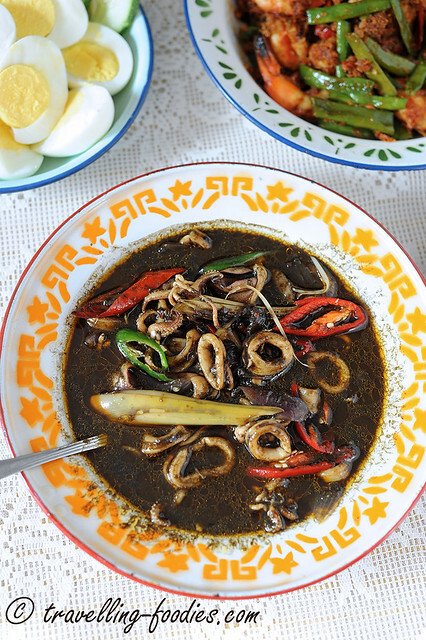 Before long, ayer asam is added followed by squid ink and the mixture is boiled and reduced to only 1/3 of its original volume. This is the time to season the kuah with salt and sugar before the process sotong are added for a quick toss, plated and enjoyed with piping hot rice or better still, nasik lemak (steamed rice with coconut milk)! Pound, blend or grind all the rempah ingredients into a coarse paste and set aside for later use. 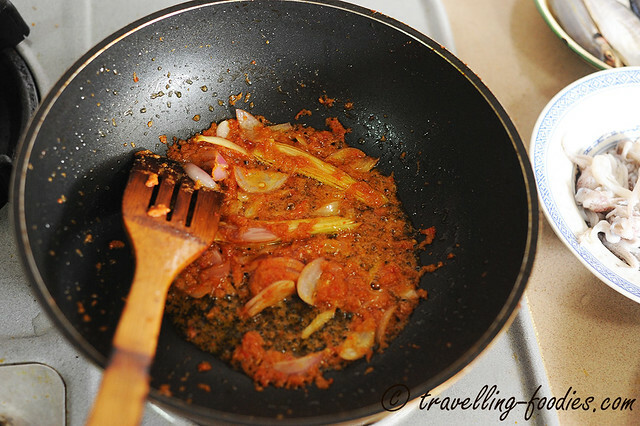 To a heated wok, add cooking oil and stir-fry rempah paste, bruised lemongrass halves, sliced onions over medium-high heat until fragrant and the rempah begins to glisten as the oil separates. 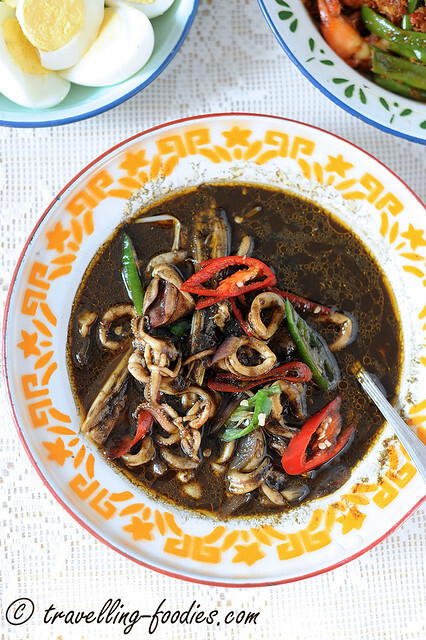 Strain the tamarind water into the wok and together, add squid ink, half of the sliced red and green chilies, and the torn kaffir lime leaves. Bring the mixture to a boil before lowering flame to medium-low to simmer. Heat and stir periodically until the sauce thickens when some of the water evaporates. When the sauce reaches the desired consistency, bring up the flame to medium-high again and add processed squid pieces. Stir-fry and toss the squid for 30 seconds or so and turn off the flame. Garnish with remaining sliced red and green chilies. NOTE: If it is served with nasik lemak, it is preferred for the sauce to be thicker and more concentrated so that it adheres to the sotong slices better. With plain steamed rice, the sauce is kept slightly more fluid for it to be drizzled over and enjoyed with the rice. This entry was posted on October 29, 2014 by Alan (travellingfoodies). It was filed under Food, Simple Eats and was tagged with asam, asam jawa, belacan, chili, lermongrass, onions, serai, seray, shallots, Sotong Masak Kuah Hitam, Sotong Masak Kuah Itam, squid, squid ink, tamarind.